I’m often asked for recommendations about photography books. Not, mind you, books about photography, but books of photographs. Here are my current favourites. They of course represent my own tastes and lean heavily toward black and white documentary photographs, but you can learn from all photography, and I think black and white images are simpler, allowing us (often) to get to the heart of them more quickly. So here in no particular order are the books that are currently on my own shelves that I turn to over and over again, and that I would (and do) recommend to my friends and students. The links below are Amazon affiliate links. Any of these would be a good choice as a gift for the photographer in your life (you, for example) and will last much longer, and have much more impact on your photography, than any of the needless plastic stuff out there. The best money I ever spend is on books. No idea which one to pick, just choose one – they’re all amazing. Constantine Manos – American Colour I can’t wait to get my hands on this one. Alex Webb, The Suffering of Light Not sure why I don’t have this one yet. Saul Leiter, In My Room, This should be released in late February, 2018. Do you have a favourite photography book (a book of photographs as opposed to books about photography)? I’d love to hear about it! Have you spent time with any of the books above and second my recommendation? I’d love to hear about that too. The Suffering of Light by Alex Webb is an incredible book and one that I revisit frequently. It changed my perspective on photography completely the first time I digested it. I’ve never checked out Ernst Haas. But a quick look at the link suggests I need to. Thanks for the recommendation! Vittorio Sellas ‘Summit’ knocks me out every time I pull it from my bookshelf. I’m never sure if it’s the mountains documented between 1879-1909 or the heavy 19thC kit that does my head in … whatever … this book makes me swoon! I do not (!) consider myself a phonebook “collector” but somehow I’ve managed to collect a lot of them on my bookshelves (and beyond). There are a ton of small press books that I stumble upon each year. It’s hard to list any favorites, but a couple that immediately come to mind from 2017 are Passage by Linda Foard Roberts, Face to Faith by Samuel Zuder, The Japanese Phonebook by Steidl and Everglades by Lisa Elmaleh. I also just purchased a beautiful copy of Edward Ranney’s Peru folio of photogravure prints from the 90s, buried in a photography bookstore’s file drawers below some old prints. An amazing find! I’ll look at phonebooks pretty much daily, just as I read novels. I also have many of the ones on your list. I’ll check out the ones that I don’t. I love how on Amazon you can find used copies of older books for pennies on the dollar, that are often in great condition. Understanding Exposure by Bryan Peterson taught me how to expose my images creatively. I think reading that took me from making snapshots to making photographs. Mastering Black and White Digital Photography by Michael Freeman took my black and white images to another level. I’ve always loved monochrome images but I always just hit “black and white” or dropped the saturation to zero. This book taught me how to I could convert my images to black and white with more impact and match more of the drama of the scene I saw in my mind. I have a couple of Joe McNally’s books but I really loved the Hotshoe Diaries. I think this book really made me think of the process of making an image especially when it comes to light. He doesn’t talk about the technical side too much but you do get a glimpse into his thought process. It really inspired me to start doing my own off camera lighting and creating more interesting scenes. In fact, I would say it was largely because of this book that I did a self-portrait a week project because the project began with a desire to learn more about off camera lighting. Definitely have one… it is the first that taught me a lot… and it is “Within the Frame”…. Got many more of course, but this is the most important one to me… Thank you David! I love “Adventures in Photography” (Hurtig pub 1987) featuring images with interesting anecdotes from contributors Pat Morrow, J. Kraulis, Greg Scott, and Ron Watts. A book that has stood the test of time for me. And don’t forget “Photographs” by Pete Turner of course. Arthur Meyerson’s book “The Color of Light” is impeccable as is “India” by Eric Meola. Would also recommend getting “ Edge of the Earth” (Art Wolfe), “Wild Africa” (Alex Bernasconi), “Inferno” (James Nachtwey) and right in your backyard, “Zebrato” (Michael Levin). The list keeps growing. This one is probably out of gamut for the genre that most of your readers engage in but “1/1000th The Sports Photography of Bob Martin” is a wonderful study in color, design, and moment with an artistic bent for a subject that otherwise viewed as documentary. Highly recommended for those who love interpretation of light in all it’s aspects. Absolutely second your choice of Genesis by Sebastiao Salgado, which is a remarkable opus. He is one of my favourite photographers and highly recommend his Africa and Other Americas books as well, but they are more confronting in their material. Also South Southeast by Steve McCurry, Poles Apart by Galen Rowell and Polar Obsession by Paul Nicklen. And yes on Magnum Contact Sheets as well. For B/W check out Ragnar Axelsson and Pentti Sammallahti. One of us is channeling the other persons thoughts. I had just asked for book recommendations in a closed Facebook group on Monday. Great collection of books. I know some. Don’t recognize others. So, I’ll have a take a look at all of them. Personally… I’ve always had an outdoor related photographic bias and thus anything from Galen Rowell & Art Wolfe are favorites. More recent books would have to include “Creative Fight” by Chris Orwig. Makes you think. Ponder. Think some more. And, then go out and create images! I’ve read it twice so far. These are great! Thanks for posting them. My go to is Intimate Landscapes (Eliot Porter). Such fantastic work. I’d be curious to hear your thoughts on any non-photography books that inspire you. I find myself drawn to writings of John Burroughs, Sig Olson, Henry Beston, and Richard Nelson for inspiration. As far as documentary photography goes, on the color side of things I’m also very fond of Steve McCurry. I have his ‘Iconic Images’, his ‘Untold’, and last week got his ‘Afghanistan’. 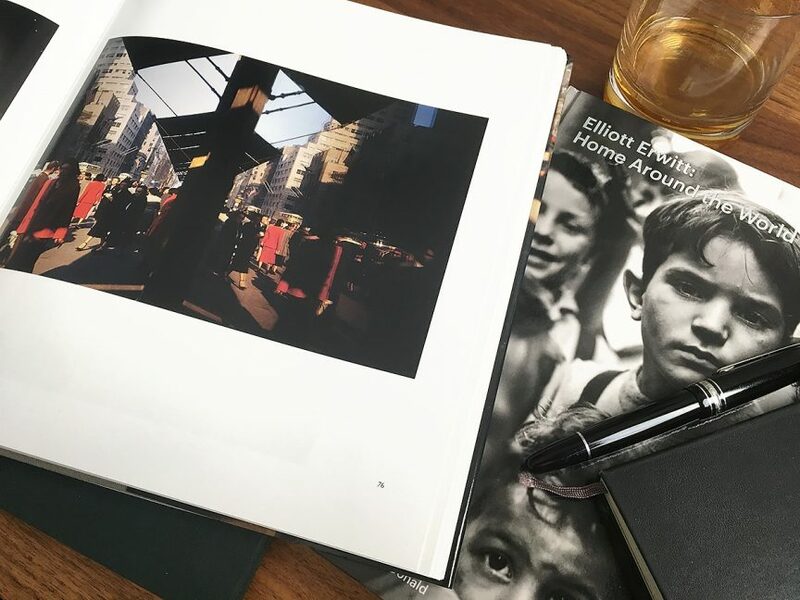 I’m more into black and white, but my project for the coming weeks will be to re-read parts of Michael Freeman’s ‘Color’ from 2005 and then look at McCurry’s pictures again in order to hopefully better understand his approach to colour. For landscape I quite like Joe Cornish’s ‘First Light’, a nice combination of gorgeous photographs and short stories about his process and artistic choices. Last but not least, I’m still very fond of the very first photography-book that I bought, Le Anh Thai’s “The Poet with a Camera”. I was starting with photography, just loved the title at the time, and still enjoy looking at his photographs once in a while. I also greatly enjoy Elliott Erwitt’s humour, but haven’t come around to buying one of his books yet. “Personal Best” is on my wish-list, however. And as far as humorous street photography is concerned, some day I also want to get myself a book by Robert Doisneau. To add another Ernst Haas, ‘The Creation’ is a stunning collection of colour photographs. Also for colour work: Eliot Porter ‘The West’, Shinzo Maeda ‘A Tree, a Blade of Grass’, and J H Lartigue ‘The Autochromes of J H Lartigue’. For black and white images: Jill Freedman ‘Circus days’, Ray McSavaney ‘Explorations’ and Paul Caponigro ‘New England Days’. Finally a photographer whose career was cut tragically short – Dean Brown ‘Photographs of the American Wilderness’. and I second the recommendtions concerning Kouldelka, oarticularly Gypsies and Exiles; and Trendt Park. Thanks for the list. And can I say that the Soul of the Camera is one of my faves. I am remiss in communicating that I wrote a glowing review on Amazon but because I purchased a signed copy for myself for the big 5 0 it did not have a record of my purchase to verify so my review was not published! Happy 2018! I have a couple I really love. One I found in a bookstore in London on the sale table. It cost me a fiver and is a firm favourite. It’s called Der Garten (The Garden) by Arno Fischer and is a book of Polaroids from his gardens. It’s a reminder to me that the everyday can be exquisite. The second one is called Gardening At Night and is by Cig Harvey. There’s something very evocative about her work and the titles of her images. I can’t quite put my finger on it, but I don’t really feel like I need to. There’s another book I gifted to a friend a few years ago that is all photographs of the ocean. I wish I’d bought myself a copy at the same time as I can’t find it now. I just remember how the photographs made me feel. But, I have the ocean on my doorstep so I can visit it for the IRL experience instead of thumbing through the pages of a book. Thank you for the list, and your perspective. Until now, I’ve ordered “books about photography.” And I’ve been shooting for over a decade. I look forward to changing my 2018 mindset. David – we’ve chatted of course about shooting and such privately – my background being in photojournalism and documentary photography. I have a deep love for b/w doc work but for color, nothing speaks both powerfully and subtly than William Albert Allard’s body of work. His book “The Photographic Essay” hearkens back to simpler times – and the images he created shooting Kodachrome 25 & 64 in some of the most marginal lighting conditions speaks prominently about being patient and waiting/watching for those moments to capture. Leica rangefinders, fast primes, a brick of film… go shoot. Second on Magnum Contact Sheets. It’s a fascinating exploration of the technique and vision of well know photographers. Cool! I’ve read the Gypsies already. What I love about “Gypsies” is the soul, emotion, and the story-telling that Koudelka does so masterfully. I think that to create a great body of work, one must immerse him/herself with their subjects– getting to really know them on a personal and cultural level.